Are vineyards just farmland, or are they cultural treasures? F&W's Ray Isle goes inside the fight to save some of California's oldest grapevines from the bulldozer. It would be easy to drive by the Salvador Vineyard in Oakley, California, without giving it a second thought. The plot is on a residential backstreet, 10 or so acres of widely spaced, low-growing vines. On one side, behind a wooden fence, is a cookie-cutter subdivision full of dun-colored suburban houses. On the other side, more houses. There's no office at Salvador Vineyard and certainly no winery, only a ramshackle, ranch-style building that the Gonsalves family, who own the property, use for storage. In fact, the Salvador Vineyard basically looks like a big, drab, sandy backyard, one that just happens to be filled with vines. It's the definition of unprepossessing. But it makes great wine. A few months ago, I was standing in the middle of Salvador with Tegan Passalacqua, the winemaker for Turley Wine Cellars. Passalacqua, a substantial, dark-haired guy in his mid-thirties, is one of the state's most respected proponents of old, forgotten, threatened, obscure and historic California vineyards. He's a Napa Valley native, but not from a winemaking family—his father drove a cement truck for 32 years. As Passalacqua says, "He poured foundations for a lot of wineries in Napa, but that's about it." Nevertheless, vineyards caught Passalacqua's interest, and after getting a bachelor's degree in public health, he shifted course into wine. The Salvador vines were planted by Portuguese immigrants in the late 1800s, like most of the old vineyards in Contra Costa County, a once-rural area that is now an East Bay commuter suburb. The soil they grow in is sandy, the texture of dunes; the stumpy, gray, knotted vines push their roots down through it, 40 feet or more, in order to produce tiny bunches of intensely flavorful grapes. Passalacqua uses those grapes for the Turley Salvador Vineyard Zinfandel, a fragrant red wine with a slightly feral spiciness that makes it unlike any other Zinfandel I've run into. The price that Passalacqua is willing to pay for the Salvador grapes—substantially more than the going rate in the region—is one reason Salvador has not, so far, been turned into yet another housing development. Just mentioning that prospect, in fact, makes Passalacqua sigh wearily. "The people who planted these vineyards are rolling over in their graves, looking at all these McMansions on top of what their families farmed for four generations," he says. Turley specializes in old-vine Zinfandels, but Passalacqua's passion for these vineyards doesn't just come from the need to do his job. For him, vineyards like Salvador aren't merely old but historic; their value extends far beyond the per-ton cost of their grapes. "They remind me that what we do is agricul ture," he says, "instead of agri-business." That idea—that vineyards like Salvador have cultural value and are, in a way, living links to California's past—is one reason why Passalacqua and several like-minded winemaker and vineyardist friends founded the nonprofit Historic Vineyard Society in 2011. 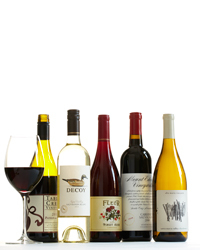 The society has catalogued more than 200 vineyards throughout the state, any number of which are at risk of disappearing. Already, many important old vineyards are gone. 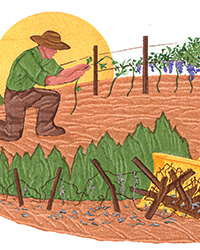 In some cases, new owners ripped out the vines and replanted to more popular varieties. That happened recently to a portion of Napa Valley's famed Hayne Vineyard: The new owner pulled out the 60-year-old Petite Sirah vines and replaced them with Cabernet Sauvignon. In other cases—I'm thinking of the Windsor Gardens Vineyard in Sonoma, from which winemaker Merry Edwards made several velvety, deceptively intense Pinot Noirs in the early 2000s—the old vineyards were paved over to make room for townhouses. Edwards and the other winemakers who used the Windsor Gardens fruit were so heartbroken when the vineyard was torn up in 2004 that they held a wake. "We even had one final vine that we put in a coffin," she recalls. The reason these old vineyards were destroyed is, of course, economic. When a vine is around 20 to 25 years old, the amount of grapes it produces starts decreasing. By the time it hits 80 or 100, its crop will be very meager indeed, and if you're a farmer getting paid by the ton for your fruit, that's a problem. Also, California's extremely old vineyards are almost always planted with varieties that pay less in the first place. Zinfandel, for instance, averages about $700 a ton in California, whereas Cabernet is about $1,400—though in the heart of Napa Valley, where those Hayne Petite Sirah vines were located, $10,000 a ton is closer to the mark. Development also adds pressure, particularly in a robust housing market (which California shows signs of re-entering). The former Windsor Gardens Vineyard? It's now the "Vintage Greens" subdivision: 474 houses, currently selling for a median price of $345,000 each. It doesn't take a genius to do the math. The Historic Vineyard Society's long-term plan is to create tax breaks that would give farmers a financial incentive for keeping old vines in the ground, but currently, the group is working mainly to raise public awareness, partly through events such as dinners and vineyard tours and also by political lobbying. The Society's signal triumph to date has been getting the California State Assembly to pass a resolution this past April, HR9, recognizing "the contribution of California's living historic vineyards to the agricultural and social heritage of the state." But language alone doesn't stop bulldozers. 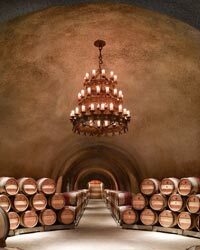 For now, the most powerful champions of old vineyards are idealistic owners who, in Passalacqua's words, "aren't doing things just for their pocketbook." The classic example is Otto Teller, the ascot-wearing, Jaguar-driving, organic-farming enthusiast who bought Old Hill Ranch vineyard in Sonoma in 1981, and later donated it to the Sonoma Land Trust (his stepson still farms it). Old Hill is one of California's greatest historic vineyards: 12 acres of 130-plus-year-old vines, a patchwork of Zinfandel, Grenache, Alicante Bouschet, Grand Noir, Petite Sirah, Mourvédre, Lenoir, Charbono, Peloursin and about 15 others, plus several other varieties, the identity of which remains a complete mystery. As Joel Peterson of Ravenswood Winery told me, "The unknown is part of Old Hill's charm." Old Hill got its name from its founder, William McPherson Hill, who headed to San Francisco for the Gold Rush, became wealthy from real estate instead, and started importing cuttings of traditional European grape varieties from Peru in the 1860s. (He was also the first person to grow peaches in northern California; he sold them in San Francisco for $2 per peach, the equivalent of about $50 today.) Old Hill has had its ups and downs—one former owner almost turned it into a housing development, and for a time it was home to a Gurdjieffian commune—but it lucked out when Teller bought it. At the time, it was "kind of a dump site," Peterson recalls, "old cars, dead refrigerators, vines overgrown with poison oak and coyote brush." Teller restored the property, and Peterson started buying the grapes. Now, Ravenswood's Old Hill Zinfandel is one of California's defining wines: a layered, long-aging, floral red, powerful yet always impressively nuanced. Peterson has been making it for more than 30 years, and thanks to Teller's prescience in putting the land into trust, he could conceivably keep on making it for 30 more. But vineyards like Old Hill are the exception rather than the rule. As Morgan Twain-Peterson, Joel's son, says, "The statement 'That vineyard is not going to get ripped out' is really 'I hope that vineyard is not going to get ripped out.' It really depends on the location and the timing." Twain-Peterson, a co-founder with Passalacqua of the Historic Vineyard Society, started his Bedrock Wine Co. to concentrate on California's historic vineyards. He adds, "You look at the post-Sideways period, from 2005 on, that was really terrible for old-vine Zinfandel and Petite Sirah in the Russian River Valley. All these farmers suddenly said, 'Hey, I can get $5,000 a ton for Pinot, I'm ripping this old stuff out.' Barbieri, for instance, that's gone. It was planted in 1905 and was the most genetically diverse vineyard out there, but it was ripped out and planted to Pinot Noir." And yet, you do have to wonder: Are vineyards really cultural treasures? We're not talking about the Parthenon, after all, or even the Golden Gate Bridge. Asking questions like this feels vaguely philistine, but I don't think it should. In the end, a vineyard is just a farm. And farms have to make money (ask any farmer, and you'll get firm agreement on that point). Why are grapes more special than any other crop? In the early-to-mid-20th century, Sonoma County was blanketed with apple orchards. Now those orchards are mostly gone, replaced by vineyards. That makes sense, because wine grapes in Sonoma County pay 10 times more than apples do per ton. Sonoma's orchards were unquestionably part of the region's cultural heritage, but it's hard to live off history when the going rate is six cents a pound. Also, just because something is old does not mean that it has great value, cultural or otherwise, despite our romantic wishes to the contrary. The analogy that always springs to my mind is books, probably because I spent a good part of my twenties working at a rare bookstore in Washington, DC. Every week, without fail, someone would turn up toting an old Bible and ask how much it was worth. The answer, unfortunately, was always the same: zero. "But it's over a hundred years old!" the person would protest. Right—and so are thousands and thousands and thousands of other Bibles. It was, after all, the first mass-produced printed book ever. From Contra Costa County, Passalacqua and I headed out over the Sacramento River Delta to Lodi; then on to Amador County, in the Sierra Foothills; and finally back down to Napa, a big loop of California vineyard history. We visited a dozen or so properties but made our longest stop at the Kirschenmann Vineyards in eastern Lodi, 15 acres of Zinfandel planted in 1915 and about four acres of other grapes planted more recently. Passalacqua and I walked Kirschenmann's precisely pruned vine rows together, the dry Lodi dirt crumbling under our feet. Unlike Contra Costa County, in Lodi all you can see is vines, spreading out for miles in every direction, until you glimpse the foothills of the Sierras in the distance. "The whole area right around here is riddled with blocks of ancient vines," Passalacqua said, "planted from 1904 to 1918. This one was owned by the Kirschenmann family straight through, till now." Lodi has thousands of acres of vineyards full of young Zinfandel vines that produce perfectly pleasant fruit, but it also has some remaining patches of very old vines, some of which have the right soil and exposure to create great wines. Kirschenmann, Bechtold, Dogtown: These are significant vineyards. And I think, in the end, that the combination of producing distinctive wine and having historical significance does, in fact, make them worth more than their cash value. So how do you save them? One by one. The new owner of Kirschenmann is Passalacqua himself, who bought the property in 2012. When I asked him why the owner decided to sell in the first place, he laughed and said, "Because I begged her to!" Initially, though, they couldn't agree on a price. At their last meeting, Passalacqua left in despair, figuring Kirschenmann's vines would end up going to one of the region's big landholders, the fruit to disappear into a massive, anonymous blend or, even worse, the 98-year-old vines would be torn out. "But the next morning, I was driving to work and she called," he recalls. "She said, 'When you left yesterday, I knew that my grandfather, my father and my brother would want you to own that vineyard.' I almost teared up. Her grandfather had planted that vineyard and farmed it his whole life, as had her father and brother. And her children weren't interested, and now she's 70. And something clicked in her, that I would take care of her family's property. And that's exactly what I would want, too." At the time these 128-year-old vines were planted, Grover Cleveland was president, and when you needed to get somewhere quickly, you rode a horse. A truly multi-generational wine: Fred Scherrer makes it with fruit from vines his father and grandfather planted in the 1970s and 1912, respectively. A tribute to the ancient vines of Contra Costa County, this red draws on the Salvador, Evangelho and Mori vineyards (the latter planted by a pair of gravedigger brothers in the 1940s). The Bedrock Vineyard's 33 acres of ancient vines date from 1888; as proprietor Morgan Twain-Peterson says, "This vineyard has a long history, and I'm just passing through." As far back as 1871, journalists were praising this vineyard; the Pacific Rural Press wrote that its wine was "superior...to any in the state."